Ranjit Singh, who cultivates paddy and maize on 22 acres of farmland with his brother, Neeraj Singh, said that although they had not yet quantified in detail the benefits of mechanical transplanting of rice, in general their observations indicated savings in labor and irrigation costs, and resulted in higher yields than traditional methods of paddy cultivation. Having started the operation in 2012, this year the acreage under mechanized transplanting in the village has increased substantially. In Rampur village, Tribhuvan Singh is also convinced that mechanical transplanting has helped them address challenges associated with farm labour in the region. The other advantage of this technology has been that it allowed him to transplant seedlings immediately after irrigating the field in an unpuddled condition, thus saving irrigation cost. “The practice of transplanting in unpuddled conditions has been helpful in saving water and maintaining of soil structure. The yield has been exceptionally good, which reinforced my belief in the technology. 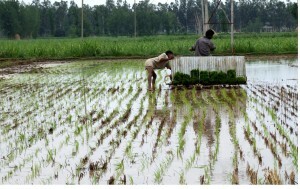 Other farmers are also convinced of this technology and were enthusiastic about opting for it,” Tribhuvan said. The technology dissemination for mechanical transplanting of paddy is supported by CSISA team in Bihar which included raising of mat-type nursery, field preparation for transplanting in unpuddled conditions, and weed management. Employment generation and the creation of alternate sources of income for rural youth through custom services on nursery raising and mechanical transplanting.